Have you heard about the The Mosh? 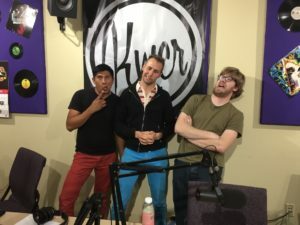 Well, The Mosh is a Spanglish rock show hosted by me, Edwin Santiago (DJ Eppy), on KWCR. Yesterday I had the pleasure to interview Jake (guitarist) and Brent (keyboardist) from Mother Lights, an indie rock band from Ogden, Utah. Although Cameron (drummer) could not make it to the interview, we enjoy talking about the beginning of Mother Lights as well as Jake and Brent’s music backgrounds. Mother Lights will be playing in the KWCR Band Off this Saturday April 15, 2017. This event will be held in the Allred Theater at the Browning Center, Weber State University at 7 pm. Listen to the interview here https://www.mixcloud.com/eppy-zantiago/mother-lights-interview-part-1/ or check out the video on Facebook.